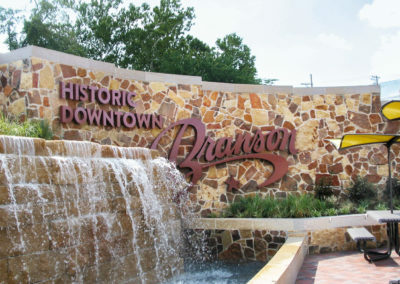 As true with many communities, the city of Branson’s downtown district is characterized by a rich history and distinct characteristics. This project focused on capitalizing on the physical, social and cultural assets of the area, while expanding multi-modal transportation and promoting economic development. Branson is a popular tourist destination, with over 7.8 million people visiting its musical theaters and other attractions each year. Crawford, Murphy & Tilly (CMT) was commissioned by the city to lead comprehensive master planning and engineering for a $12 million, six-block historic downtown streetscape revitalization. The goal of the master plan is to create sustainable “complete streets” that will improve vehicular, pedestrian, bicycle and multi-modal transportation; increase economic viability; efficiently manage stormwater; identify green solutions and create inviting places for pedestrians. CMT led a team of landscape architects, urban planners and engineers to develop a comprehensive multi-year program to achieve these objectives. A component of this project is connecting guests at Branson Landing and Lake Taneycomo to the downtown area – a five minute walk to the west. The comprehensive master plan also includes new park, recreation and flex spaces throughout the downtown area. The project also hopes to maximize the potential of the downtown area to meet the wants and needs of the community, business owners and residents. 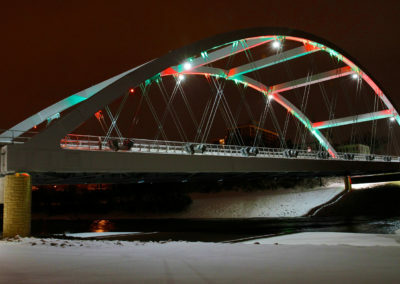 The project involved a highly-productive public engagement program involving a wide range of stakeholders, especially downtown business owners. To facilitate this efforts CMT established a downtown design studio to encourage ongoing input and feedback. The project was successful in bringing diverse interests together and generating community-wide enthusiasm. CMT has subsequently served as design engineer on various phases of design for this multi-year program. [CMT] managed to take a diverse group of stakeholders (the steering committee) with conflicting personal agendas, and building on what they had in common (their shared devotion to and collective interest in the future of the Downtown District), you nudged them slowly but surely toward consensus. It doesn’t get much better than that. The need for a consistent theme and identity for the historic downtown was a major consideration. The unique elements of the new community branding include specific identifiers, landscaped planters, signage and historical kiosks – all of which accentuate a sense of place. [PICTURE OF THE TREE MEDALLION] The tree medallion was developed and selected as the overall theme for the historic downtown improvements with plans to incorporate the theme onto street furnishings, light poles, signage and utility boxes. Advanced wayfinding and additional signage, with an easily identifiable consistent look, help direct traffic and pedestrians. Visitors are educated with tours of many historical sites located within the historic downtown area during “walking tours” with interactive maps using mobile apps. CMT designed a designated location for tour buses to load, unload, and park while the bus patrons visit. The Trolley system could also include such a location on their route. As part of the project improvements, the city has expressed the desire to replace and upgrade all utilities within the project limits. This includes water, sewer and stormwater. A total roadway replacement will provide upgrades to the existing storm sewer system with new inlets and curb and gutter capacity to better convey storm water. CMT recommended LED lighting along the corridor during night-time sport and extracurricular activities with strong consideration given to enhanced LED lighting in the alleyways to help reduce crime and increase safety. 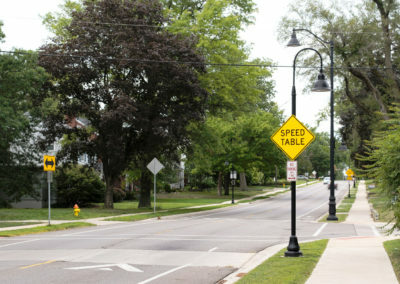 Because of the anticipated mix between, trucks, student drivers, bus traffic, and pedestrian use, CMT suggested traffic calming measures should be implemented. Roundabout intersections were also implemented to deliver this safety goal and increase traffic capacity at the intersections. CMT added a permanent bandstand for festival and street performances; an outdoor entertainment stage for special performances with built-in power for amplifiers, lights, and equipment. Instead of developing concepts and alternatives with little local understanding and insight, the team engaged the public in a series of listening sessions to understand key issues and challenges related to the railroad, transportation, and safety within the study limits. CMT was committed to being accessible during the design and construction of this project, we open a “design studio” in the development area. All members of the public were invited to a special event – an ice cream social – where participants were able to vote and voice their opinions on various issues related to the downtown. The development of Liberty Plaza was driven by the desire to change the location of the area that used to host many of the downtown festivals and special events. The concept was tailored towards providing the visitor with a “wow” factor. The promotion of the historic downtown for extended business hours and night-time activity was listed as a goal of the project to help attract a younger demographic and increase economic activity for restaurants, theaters, and local retail stores. The design of Link Market, a flexible use space, included improving the aesthetics of the area while improving pedestrian flow. This space would provide visitors with numerous activities throughout the calendar year, with the flexibility to attract people and generate interest. A new trolley stop is also proposed along the westbound side of Link Market. CMT provided infrastructure to accommodate a flexible space for special events and festivals. Extensive coordination with members of the community and event planning staff has led to recommendations related to flexible space and infrastructure for events and festivals in the downtown. For example, in the winter, the flex-space may be an outdoor ice rink; in the spring and summer the space may convert to a zero gravity pool and fountain.